You warp in to an empty pocket but soon find yourself surrounded by a swarm of Hostiles. Group spawn is slightly delayed and distances vary. 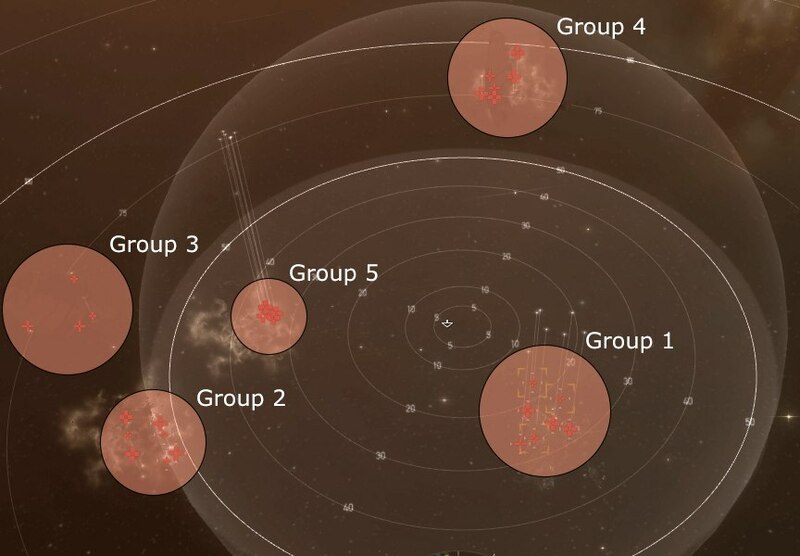 The spawn order is group 4, 2, 1 and then 3 and 5. Group 1 will auto aggro after some time. Proximity aggro is a major factor in this mission. Please be aware that you can aggro a neutral group by just moving too close to it. The proximity distance for Group 4 is about 80km. It is recommended that you do not move your ship. All other groups remain neutral until attacked or approached. Attacking group 1 does not aggro any other groups. Attacking group 2 will aggro group 3 (and vice-versa). Attacking group 4 will aggro group 5 (and vice-versa). To throw off aggro from group 5, wait until an enemy ship from group 5 has locked your ship. Warp out, then warp back in. If you have to move be careful not to approach the neutral groups, move up or down as you are surrounded from the sides. Recommended order of elimination : Group 1, 5 (if you do not warp out to throw-off aggro), 4, 2 and 3. Except Gist Saint and the Battlecruiser, the Battleships are all coming in range of 5- 8 km. Great for salvaging afterwards. Sniped all Hostiles from the Beacon in order of proximity, from nearest to farthest. Easily done in a T2 fit Dominix with T2 Bouncer, ~620 DPS, 112hp/s rep. Did not get scrammed. However, this approach is not always feasible. 25 Veldspar Asteroids 28 to 135km from warp in.